Printed and mounted in his characteristic light boxes on a scale suitable for advertising, Wall exhibits two groups of photographs made in the past four years: a sequence of images shot in Sicily depict pre-existing, found sites while the contrasting pieces orchestrate scenarios that have a cinematic and fictional quality. 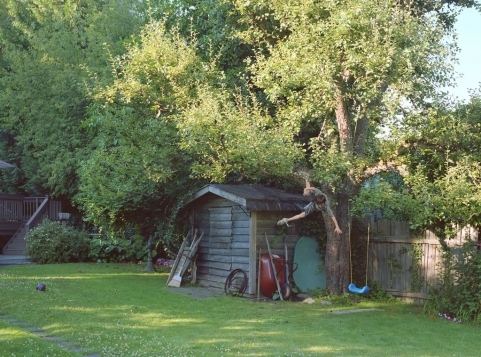 ‘Boy Falls From A Tree’ illustrates a boy tumbling in the air towards the ground. Caught in mid-air with limbs splayed like a jumping cat trying to remain upright, the boy’s physical gestures fulfill the definition of a snapshot, the ‘stolen moment’. But certain clues suggest a wholly staged event. A red, upright wheelbarrow stands against a garden shed beside a blue, plastic swing suspended from the tree. Each object helps to set the stage of a suburban garden. This image asserts both the traditions of homemade photography and the wandering opportunism of photojournalism. ‘Boxing’ illustrates two adolescent boys sparring with each other in a home. Every detail of the imaginary parents’ taste is ironically signaled in rows of ornaments on shelving that seems wholly contrived, devoid of any sign that this is a truly, functioning space. The fight between the boys with their gloved hands raised to strike is so precisely enacted within a domestic setting that its uncanny quality signals premeditation whilst managing to meet our expectations of the scene. Wall successfully establishes a tension here between acceptance and doubt. The event itself is intrinsically banal while also achieving the grandeur of epic painting. In ‘Band & Crowd’, Wall photographs a desultory concert in a dance hall. Every detail of the musicians on stage, the sparse audience and the architecture is an approximation of real experience. But such hyperrealism on this scale deliberately provokes a disquieting unease. Can a life-like impression be fully trusted in the formal splendour of this highly finished, backlit print? These works reiterate Wall’s ongoing themes of visual intention and reception dating back to the 1970s, but his more distanced observations of Sicilian landscapes where contemporary life encounters history, promise new directions with less staging and the potential for even greater instability.